Corporal Russell Hennen served in the U.S. Army during World War II. In 1943, Hennen sustained an unspecified injury and consequential infection which necessitated a military discharge and his transfer to the Oteen Veteran's Administration Hospital.The letters written between Hennen and his then girlfriend, Madeline Tabet, were exchanged between 1943 and 1945 and detail his stay in Oteen. Corporal Russell Hennen served in the U.S. Army during World War II. In 1943, Hennen sustained an unspecified injury and consequential infection which necessitated a military discharge and his transfer to the Oteen Veteran's Administration Hospital. The letters written between Hennen and his then girlfriend, Madeline Tabet, were exchanged between 1943 and 1945 and detail his stay in Oteen. For more information on the location of this collection, please consult the Western Regional Archives, Asheville, N.C. Copyright Notice: Copyright is retained by the authors of these materials, or their descendants, as stipulated by the United States copyright law (Title 17 US Code). Individual researchers are responsible for using these materials in conformance with copyright law as well as any donor restrictions accompanying the materials. Processed by Sara Kaglic, October 2016. Isaac Russell Hennen (1917-2014) was born in Buckhannon, West Virginia. Hennen enlisted in the Army in 1942 as part of the 13th Armored Division, a division of the 153rd Armored Signal Company. In September of 1943, Hennen was hospitalized at Camp Beale in Marysville, California for an unspecified injury and infection. He was briefly transferred to Fitzsimons Hospital in Denver, Colorado before being sent to the Oteen Veteran's Administration Hospital. Mary Madeline Tabet (1919-2007) was born in in Charleston, West Virginia. During the war, Tabet resided at 722 Helen Ave., Charleston, WV with her sisters, Victoria and Virginia. Hennen and Tabet were married in 1945. After the war Hennen worked as a personnel manager at Columbia Gas Transmission. He died after a short illness on March 26, 2014. Tabet died November 20, 2007. Isaac Russell Hennen and Mary Madeline Tabet Hennen Letters, Western Regional Archives, State Archives of North Carolina. This collection came to the WRA as two separate donations. One was purchased by Heather South via e-bay, and the other came from Matthew Peek who acquired them in the same manner. Collection Overview: There are 75 letters in total with 75 corresponding envelopes; 58 of the letters were written by Madeline Tabet and sent to Russell Hennen. The remaining 17 letters were written by Russell Hennen and sent to Madeline Tabet. The letters detail the relationship of a young couple dealing with separation during WWII and their progression from dating to engagement. Through these letters, the couple expresses their love for one another, their desire to be reunited, and their hopes and plans for the future. They also share details about their daily lives including social gatherings they attend, movies they have seen, and news about friends and relatives. The following letters reference the hospital at Oteen. March 31, 1944: First letter addressed to Oteen. "Cpl." is replaced with "Mr." on envelope address. April 2, 1944: Tabet discusses the likelihood of hospital passes. First mention of "hiking ward." April 4, 1944: Hennen is roomed with one other man. April 11, 1944: F-2 described as "permanent ward." April 17, 1944: Hospital address includes "Ward F-2." August 14, 1944: Mentions of the arts program at the hospital and how "the board has to approve the things you all make." August 25, 1944: Hennen hopes to pass a test to get into "hiking ward." 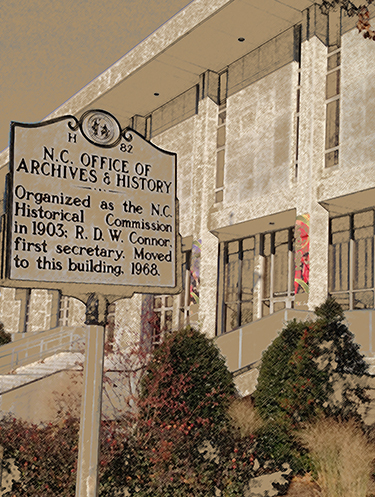 December 27, 1944: Hennen gets day pass to go into Asheville. January 18, 1945: Hennen is transferred to new ward after passing a "test." Learns to knit in the hospital. January 26, 1945: Rumor of hiking ward stays shortening from 4 months to 2 months. March 2, 1945: Hennen mentions visiting the Grove Park Inn. March 6, 1945: Hennen gives detailed account of what hiking ward entails: patients are led on hikes which gradually increase in length over time. Begins with 15 minutes twice a day; ends with 2 hours a day before you are fit to be discharged. March 29, 1945: Hennen is hiking 30 minutes twice a day. May 26, 1945: Tuberculosis expert visits the ward to talk to patients about work opportunities after hospital discharge.